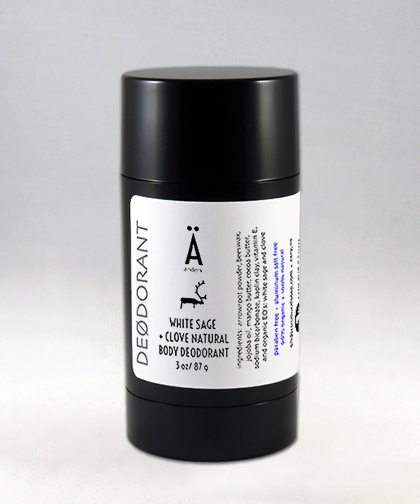 Our White Sage “all natural deodorant” is a great compliment to our line of products. The White Sage essential oil is a natural deodorizing scent. Its Antioxidant and antiseptic properties compliment this top selling deodorant. The spicy scent of Clove essential oil adds to the fresh clean scent in this deodorant, creating a very synergistic blend of anti-odor essential oils. We created this deodorant as our men&apos;s deodorant, but we have as many women who also like this one. We introduced our “Natural Body Deodorant” out of a desire to offer an aluminum salts free deodorant. Most people feel that “natural” deodorants just don&apos;t work, are sticky when applied and not worth the trouble, but not only does our stick deodorant work, but it also smells great. We formulated our all natural stick deodorants to keep you dry, and thanks to the organic essential oils used, odor-free. They are non-greasy, and non-sticky with regards to the overall feel, and they are: free of aluminum salts, parabens, phthalates and propylene glycol. Arrowroot powder is anti-inflammatory and also can work as an antiseptic, making it perfect for irritated areas such as burns, rashes and sores. In some countries, it is even used with water as a paste to apply to open wounds. Arrowroot is predominantly known for its soothing properties. A natural healer for small irritations, it assists with the drying out of wounds, rashes or blemishes. It is very effective at drying out blemishes and keeping skin clear naturally. Arrowroot powder calms the skin while balancing the oil and effectively fighting against acne through penetration of the skin. It encourages a stronger skin surface and works to reduce unnecessary oils while contributing to the healing of irritations. It is also often used in cosmetics because of its absorbent quality and can also be used to thicken the consistency of lotions and moisturizers. The high starch content contributes to it being able to maintain the skin&apos;s softness and keeping oil levels even. Because of these absorbent qualities, arrowroot is also used in deodorants to remove excess oils. This is why arrowroot is even used as an acne treatment, giving it recognition as one of the most versatile substances on the market. This fragrant spicy oil is distilled from the immature flower buds of the Clove plant. It is a common homeopathic ingredient used to ease pain and discomfort due to Clove&apos;s natural analgesic, antiseptic and antioxidant properties. Chemically speaking, the active agent is eugenol. This agent is used in baby teething formulas and in dentistry to provide temporary relief of pain. Apply as needed to clean dry underarms.